Race 3 is full of such dialogues that leave you cringing. “Ye zindagi ke race ke jhatke, paida hone ke pehle shuru hotey hain aur marne ke baad bhi khatam nahi hotey (The bumps in the race of life start from birth and continue even after death),” Sikander says after a fight sequence. 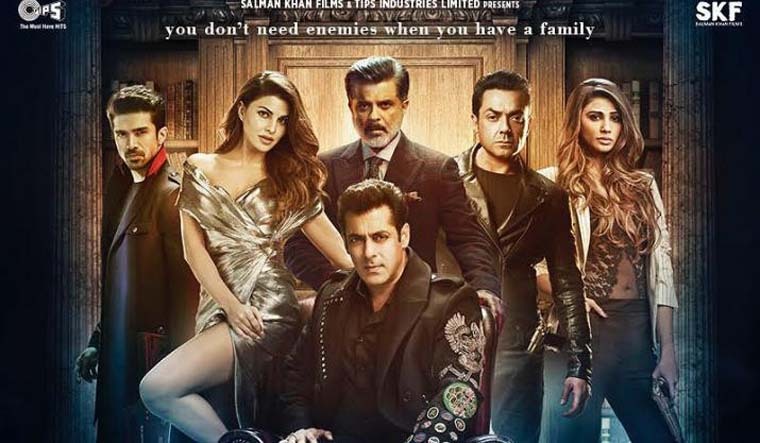 Most of the cast, including Jacqueline Fernandez, whose character is as confusing as Khan's real-life image, comprises famous Khan loyalists. The film is about Shamsher Singh (Anil Kapoor), a ruthless arms dealer who settles in Al-Shifa Islands after fleeing from a small village, Zila Handiya, in Uttar Pradesh. That also leads to Kapoor and Khan conversing in a lot of Bhojpuri in the film, which would horrify the loyalists of the language. Khan is Kapoor's stepson, who manages his business from Beijing. Kapoor's twin children (Saqib Saleem and Daisy Shah) are threatened by the love their father has for Khan, leading to a constant feud in the family. The family loyalists are Raghu (Sharat Saxena) and Shamsher’s bodyguard Yash (Bobby Deol). There’s an arch-enemy Rana (Freddy Daruwala), who is a threat to the business, but the film is more about a brother trying to keep his family together, so he hardly has a role to play. What does play a major part in the film are close-up shots of Khan during dialogues that are meant to be hard-hitting, but which fall flat because of infantile writing. Or, trying hard to portray Khan, now above 50, as a 35-year-old action hero. But Khan, also the producer of the film, is too generous. The spotlight is shared almost evenly—Bobby Deol gets a shirtless action scene with Khan himself, and a romantic number with Shah. Who would have thought that the team of Abbas-Mustan, whose logic-defying films are still a sincere effort to keep up with the times, will have competition. Well, they don’t. Both Race and Race 2 were cringeworthy. But we laughed at the dialogues, or passed off the vintage action sequences as a silly but lovable attempts. Here, though, you wonder why Remo D’Souza, the choreographer-turned director, is stuck in the 90s. Except for blowing up fancier, more recent models of cars, the action scenes look dated and repetitive. He has made a bad spoof of a spoof, and we are told that there’s another one on the anvil.